Learn how to create a full scale chalkboard wall in three easy steps! If you follow us on Facebook, you may have noticed that we painted a chalkboard wall in our dining room. I originally thought I wanted to put the chalkboard wall in the kitchen. But after living with it in the dining room for several weeks it is SO PERFECT here. I have to say it was a fabulous decision and the kids are LOVING it! I use it to write homeschool assignments on (page numbers, etc) and to show examples (like parallel and perpendicular and why the fish is the sign of being a Christian) and the kids draw ALL OVER IT with their friends. It was a bit of a time consuming project (not really in actual work, just in the waiting), with multiple coats and dry time, but it was really simple and totally worth the wait. 1. Paint wall with Chalkboard Paint. It’s fairly thin stuff, so I had to paint three coats for good coverage over the old mustard colored wall. Let cure for a few days. Follow the package directions. Don’t skip this step, or you won’t have a good hard surface. 2. Cover ENTIRE wall with chalk. This is called seasoning the board. Just rub the whole surface with the side of a piece of chalk. We went through more than a few pieces for this step, which is why we bought a classroom size box of dustless chalk. 3. 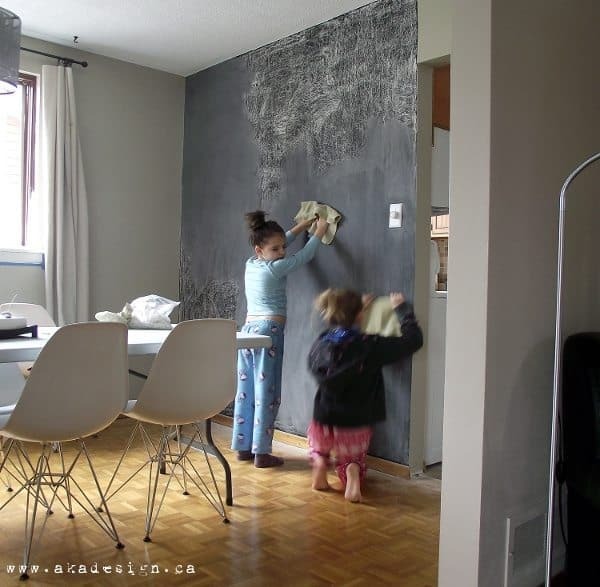 Using a cloth or a chalkboard brush, wipe down the chalkboard wall. Now it’s ready to use! And trust me it will get used! What about the chalk dust? Some of you have asked about the chalk dust. Dustless chalk definitely makes it better. But there is still dust, it just seems to drop to the floor instead of floating around all over the house. I do wipe the floor and baseboard along the base of the chalkboard wall a couple of times a week. Not really a big deal, which will be even less of a big deal when we replace the ugly wood baseboards with crisp white ones. Update: We lived in this house with the chalkboard wall for 4 years and loved it! 🙂 Just in case you were wondering! Have you ever painted a chalkboard wall in your house? Would you? We did my daughters room..one wall and it is so fun!! Cool project! Have you guys tried using chalk markers? I painted something with chalk paint and wasn’t sure if I could use the chalk markers or not, since they have to be erased with water. Just wondering! Hmm , I didn’t know you had to let it cure. I made a small framed chalkboard and started using it the same evening. Maybe different brands??? The wall looks great! And it getting used is the best part! Looks like a fun spot in the kitchen & I love that your kids are having so much with it! Great article on window coverings I enjoyed your ideas! Great tutorial! I just made a fun media / study / play space with my kids (complete with a huge wall decal), and I’d love to make one of the walls a chalkboard wall. I will definitely be using your tips when I start that project — thanks again! Love your blog. Have fun with it! And be patient with the cure time….totally worth the wait! Ok, I want to do one of these in my home, but my walls are textured. Were your walls textured? Does it still look good when you write on it? Our walls are dry walled and have a slight texture. It depends how textured your walls are. Just wondering why covering the entire wall with chalk after painting is a necessary step? It’s called seasoning the chalkboard. If you skip this step the first words you write will leave a permanent impression or shadow! Trust me on this one! Did you have any texture on your wall? Would you recommend sanding the wall if my wall is textured? There is a bit of texture, yes. I didn’t sand the wall though – totally too lazy! It worked out fine. I’m thinking about putting one of these in my bedroom, does anyone know if the tinted chalk works as well as the black? Or if I end up only doing one wall, how big of a surface would work? I can’t wait to try, though!!! What a beautiful blog. Came across you a few years ago, but my hands were tied trying to help you with a different line of chalk based paint. Obviously, you’ve done quite well and I’m so happy about that. If you want to try any van Gogh Fossil Paint, let me know, I’d love to get some into your talented hands. Whoop whoop! I read a bit more of your blog and see you’ve used our Fossil Paint! Woohoo! Well email me if you want a little freebie! THANK YOU for mentioning us!